Released on: November 17th, 2014. In 1974 two nobodies from Texas wrote a script loosely based on the exploits of cannibalistic madman, Ed Gein. Interestingly enough, the Gein story had been mined before in Alfred Hitchcock’s Psycho, a movie that went on to change the face of horror movie history. Ironic, then, that this little 16mm low budget feature debut from director/co-writer Tobe Hooper and co-writer Kim Henkel would likewise change the face of horror movies in much the same way as Hitchcock’s film did a decade earlier. This time, however, the take on the Gein mythos would be on of considerably more brutality, and the resulting film has rightly earned itself a reputation as one of the scariest and most intense films of all time. It’s a story that horror fans know off by heart at this point. Four teenagers – Jerry (Allen Danziger), Pam (Teri McMinn), Kirk (William Vail), Sally Hardesty (Marilyn Burns) and her wheelchair bound brother Franklin (Paul A. Partain) – pile into a van to go visit a grave out in the middle of the country. Along the way they run out of gas and pull over at a roadside gas station/barbeque joint only to find that the place is dry and they won’t be able to fill up their vehicle until the next morning. In true horror movie fashion, one by one they head out from the relative safety of their vehicle to either get gas from somewhere else or find help and of course, soon enough their numbers start thinning. It seems that something is very, very wrong at the run down old house not too far from the gas station and when Sally eventually finds herself there trying to track down her friends she winds up being held captive by a family of cannibals comprised of a strange hitchiker they’d picked up earlier (Edwin Neal), an older man (Jim Siedow), a huge dim witted maniac named Leatherface (Gunnar Hansen of Hollywood Chain Saw Hookers) and their invalid Grandpa (John Dugan). From this point on, Sally’s life is made to be a living Hell and she’s in for a night that she’ll never forget. From the opening narration (courtesy of John Larroquette of Night Court fame!) and text scrawl to the beginning shots of a sun baked graveyard, The Texas Chain Saw has an atmosphere about it that can only be described as wrong. 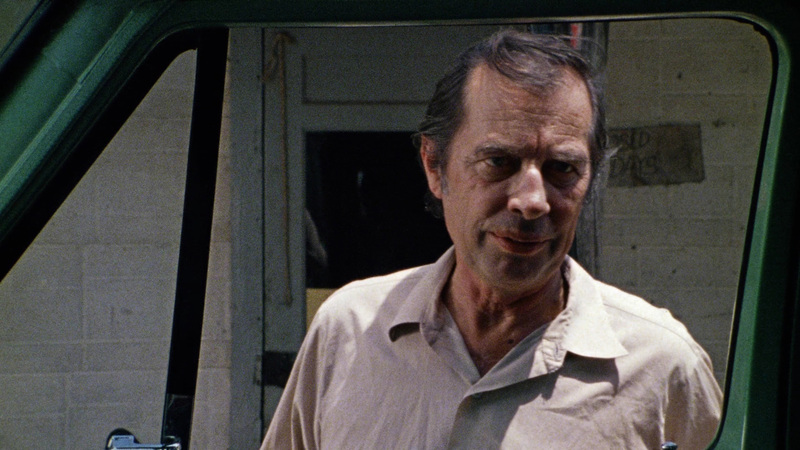 The film wreaks of dead animals and unclean sweat stained miscreants and it’s one of those rare movies that is completely disturbing even when things during the more subdued moments. Granted, there’s really very little character development for either the teenagers or the family that ultimately takes them down – snippets are dropped here and there, enough so that we can distinguish them from one another, little more. What matters here is what happens far more so than who it happens to. Thankfully, Hooper was savy enough even at a young age and with relatively little experience to pace the film right so that we don’t really notice the lack of character development as we’re too busy having the crap scared out of us to care. The first half hour or so of the movie builds nicely. We know from the moment that they let the hitchiker into their van that they’ve been marked and his actions inside with his knife confirm it. From there, we know it’s going to all go downhill fast for these friends. The man at the gas station knows it too and while he half-heartedly encourages them to come on in and have some food, it’s hard to notice that there’s something rather sinister about the man and his mannerisms don’t do a very good job of hiding that. Of course, the very simple premise of just wanting to gas up the van and move on is one that anyone who has ever run out of gas can relate to so in that respect we’ve got all the build up we need. 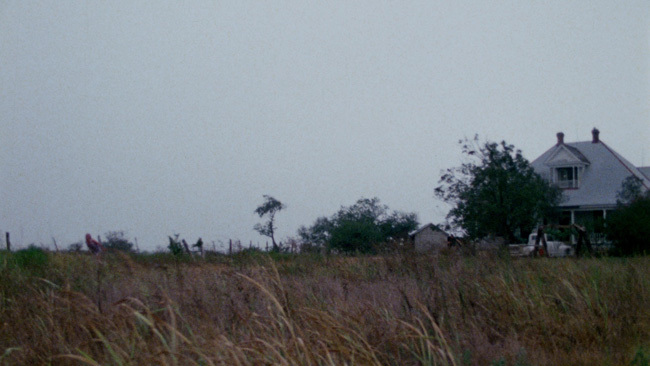 There’s a feeling of abandonement that the movie captures very well during these building moments early on and it serves to set up the final half of the movie quite well. And what a final half it is. 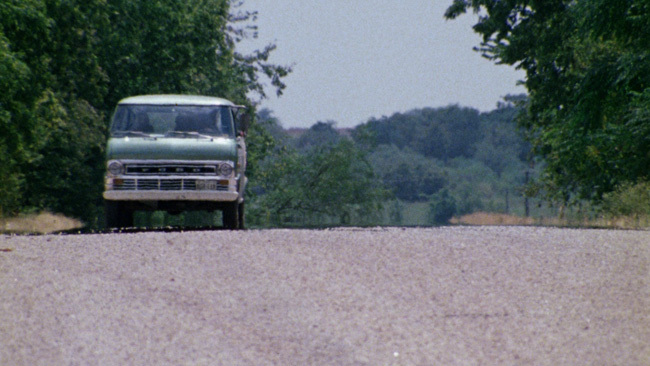 The last part of The Texas Chain Saw Massacre is horrifying. 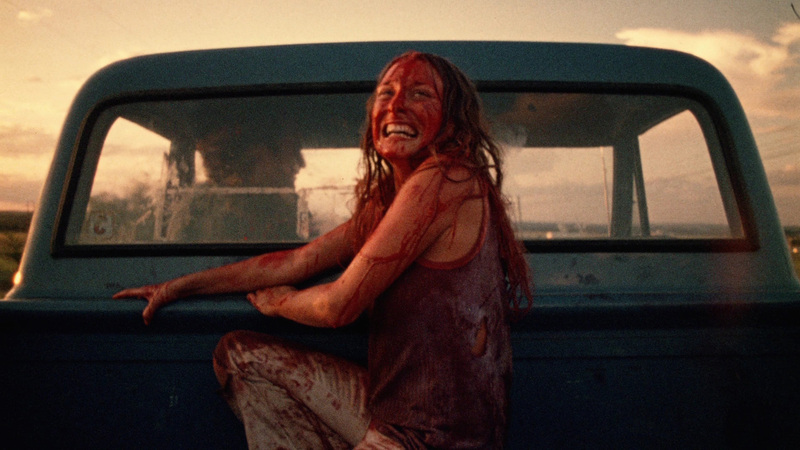 From Marilyn Burns’ manic performance as the screaming and completely terrified Sally to Hansen’s volatile Chain Saw wielding madman to Neal and Siedow as the slackjawed but sinister yokels all the way to Dugan’s turn as the literally blood thirsty patriarch of the clan, this is a half hour of raw, unadulterated horror in its purest and most visceral form. All that filth and sweat and that unclean smell that permeates the first part of the film serves as only the mildest form of foreshadowing and watching this film even more than three decades after it was made its safe to say that it has lost none of its power. Remakes and Rob Zombie inspired knock-offs have their place alongside the original but none of them can come close to the intensity that Hooper and his colleagues were able to capture with this film. Everything from the arid cinematography to the decayed look of the set design to the completely unnerving score to the almost improvised and all too genuine performances adds up to what is damn close to the perfect horror movie. 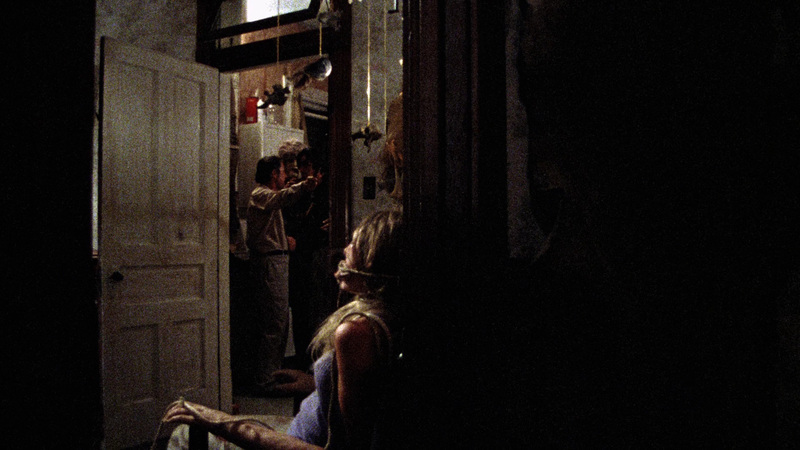 Texas Chain Saw Massacre arrives on Blu-ray from Second Sight in a newly restored transfer in AVC encoded 1080p high definition framed at 1.77.1 widescreen. The new 4k restoration, supervised by director Tobe Hooper, looks fantastic on this disc. Detail is consistently impressive but the film remains a very dark, grainy and nasty looking picture, just as it should be. Color reproduction looks dead on and skin tones are very lifelike and natural. As grainy as the picture is, there isn’t much in the way of actual print damage to complain about at all. The disc is well authored so there are no obvious compression artifacts or noise reduction nor is there any edge enhancement. Texture and contrast look great and all in all, this is a great looking picture. Audio options are provided in English in your choice of PCM Mono, PCM Stereo, DTS-HD 5.1 Master Audio and DTS-HD 7.1 Master Audio. Optional subtitles are provided in English only. Both lossless options sound quite good here with decent range and channel separation evident throughout. Dialogue is nice and clean and clear and easy to follow while the sound of the Chain Saw is appropriately piercing. Bass response is strong and powerful when it needs to be but never to the point where it buries things and the various sound effects used throughout the film are properly balanced. Purists take note that the mono option also sounds quite good here. The extras on the first disc in this two disc set are limited to menus, chapter selection and four commentaries, two of which are new. The first new track features Tobe Hooper moderated by David Gregory who keeps Hooper talking pretty thoroughly here. 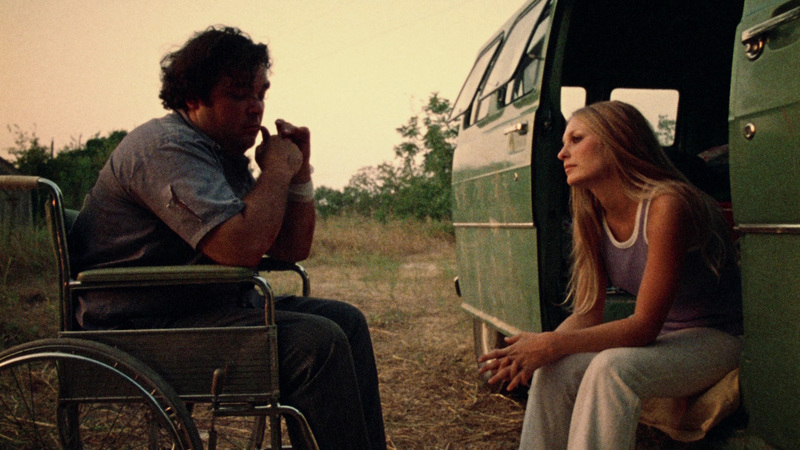 They start off by talking about what inspired the story, how that armadillo wound up in the movie and some of the issues that Hooper wound up with while dealing with the MPAA – apparently you can’t show a girl hanging on a meathook in a movie and get a PG rating! 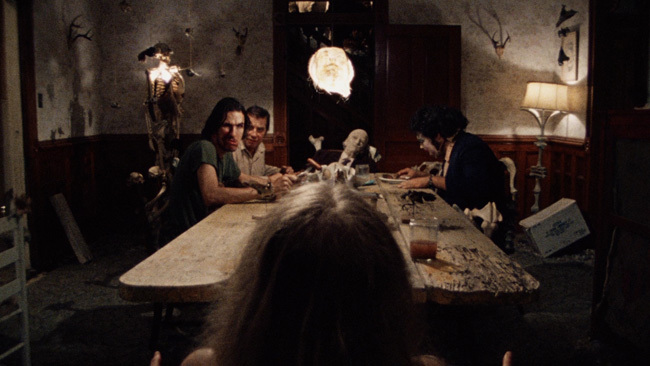 Hooper also chats about the cast members he directed, the importance of capturing ‘eccentric lunacy’ without it looking like someone is acting, and what sort of condition the house was in when they shot the film there. He also discusses how the infamous hammer to the head scene was done with a foam rubber mallet, how in this original film they intentionally do not go into Leatherface’s background and how you wind up coming away with your own take on how he got to be how he is in the movie. 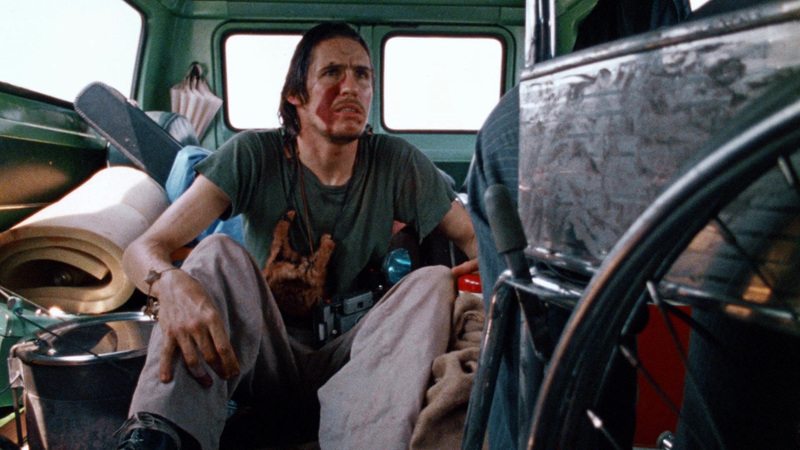 Hooper also talks about some of what went into some of the sound effects used in the film, the infamous finger cutting scene, shooting in one hundred and ten degree weather and the complications that come from lighting a scenario like that and quite a bit more. You’d think at this point there wouldn’t be a whole lot more for Hooper to talk about in regards to this movie, but this is, despite a couple of moments of quiet here and there, a very engaging and interesting track. The second new track features cinematographer Daniel Pearl, sound-recordist Ted Nicolaou and editor J. Larry Carroll, once again moderated by Gregory. They talk about how they wound up working with Hooper, how long they worked on the shoot for the picture, the tricky side of shooting with available light in a van, what it was like being shut down by the producers at one point, and what happened to the house after the movie was shot there. There’s some stories about shooting in very cramped conditions and having to mic the actors with lavaliers, experimenting on the set with dolly shots, the intensity of the meathook scene and how people always talk about how gory the film is when in reality it isn’t that bloody at all and why the movie was made that way. 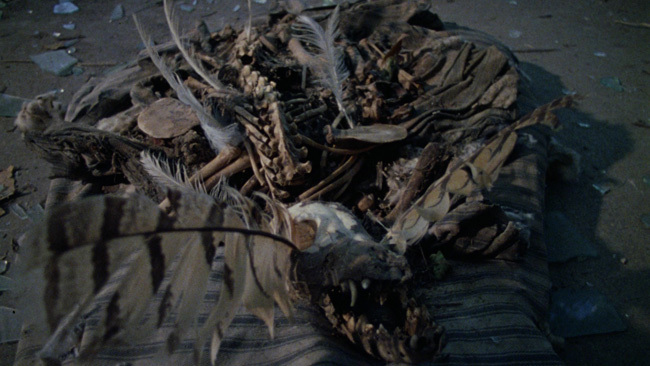 There’s also some talk here about how and why the dried skin props in the movie look the way they do, the difficulties of shooting a Chain Saw attack scene in the brush outdoors at night, some of the prosthetic work featured in the movie and the trickiness of reassembling uncoded footage as it was shot so that scenes would actually make sense in the final cut. Again, this is a pretty active talk that offers up a lot of information that isn’t covered on the other commentaries that have been recorded for this film over the years and it’s very much worth listening to. 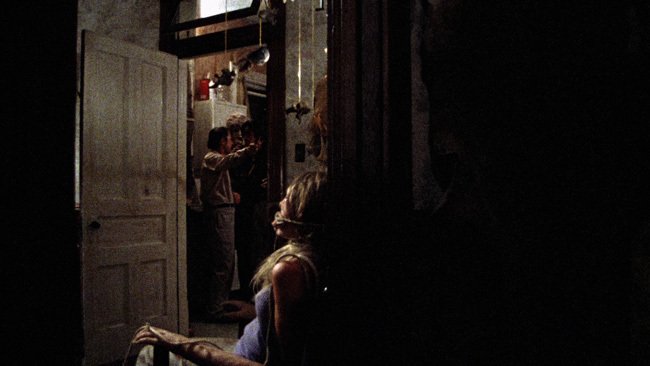 Carried over from the previous release is a commentary from the cast of the film including Marilyn Burns, Paul A. Partain, Allen Danziger who are joined by makeup man Robert A. Burns and moderator David Gregory. This track is pretty remarkable in that shortly after it was recorded both Partain and Burns passed away, instantly giving this discussion some historical significance. Even with that aside, it’s an interesting talk with Burns in particular having a really sharp memory and a lot of stories to tell about her involvement in the film. Gregory keeps things moving at a quick pace and when things slow down he’s fast to interject with another question which seems to keep the participants pretty interested in telling him about their experiences. This track makes for a great companion piece to the other commentary included on the disc as it’s obviously skewed towards the performers’ perspectives. It’s interesting to see how experiences differ in terms of being in front of or behind the camera while a movie is being made, particularly on one that had as grueling a shoot as this one did. Also carried over from the past release is an audio commentary courtesy of Gunnar Hansen, Daniel Pearl and Tobe Hooper. This is the same track that was on the Elite Laserdisc and the Pioneer DVD but it’s a fascinating discussion even if you have heard it before. This commentary also has some historical significance as it documents the first time that these three men had sat down with one another since the movie was made back in the seventies. This lends it some enthusiasm as well as an interesting air of nostalgia while it plays back but this is far from a fluff piece as it’s packed with information. They discuss the rating of the film and the original title in addition to working with some of the actors, shooting on location in the house and some of the issues that crept up on set while the movie was being made. There’s also a really good sense of humor in this track that shines through in a few spots, particularly when Hanson has the stage. Most of us have heard this track before as it’s been re-issued a few times before but revisiting it proves to be a very enjoyable experience never-the-less. Moving on to the second disc, the new extra material starts off with a featurette called Cutting Chain Saw With Editor J. Larry Clark that runs eleven minutes. He talks about how he got into editing doing TV commercials and industrial movies, how they originally figured Chain Saw would just be a local low budget horror movie that might play a few drive-ins at most, how the cast and crew were very naïve and hadn’t really worked on a ‘real’ movie before and how without a script supervisor on set putting things together in order got to be pretty hectic. He also talks about what worked with Hooper’s creative process on the shoot and what it was like working with him, as well as what it was like working on Tourist Trap after TCM. Granpaw’s Tales With Actor John Dugan is a sixteen minute piece in which the actor who played the grandfather under all that makeup. He talks about how he was related to Kim Henkel which lead to him getting the part, how he was told that the character was ‘an embryonic old man’ and how that was more or less all the direction he got, and the importance of the grandma in the movie too! He shares some stories about working with the rest of the cast on his scenes, how the shoot was long and grueling, how everyone was ‘fried’ on the set and how that added to the movie’s tone. He also talks about having to have six hours of makeup work done and then having to shoot for twenty-six hours straight after that. 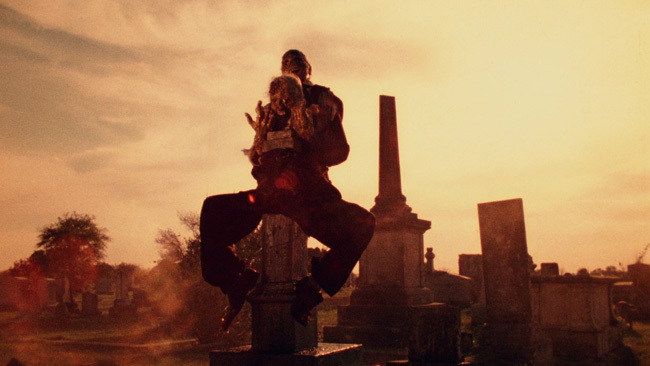 He then talks about some of the other characters in the film, including how Franklin is particularly annoying, projects that the other cast members had been involved with before this movie, the importance of Marilyn Burns’ work in the film and how everyone was miserable by the end of the shoot! Dugan doesn’t mix words here, he’s completely blunt about his experiences and refreshingly honest about everything. As such, it’s a very good interview and a nice addition to the disc. The Horror’s Hallowed Grounds featurettes, also new, runs twenty minutes and here we accompany Sean Clark as he revisits the different locations used in the film. We get some great ‘then and now’ shots as we visit the cemetery, the gas station, and of course, the house. Stuff like this is always interesting to see and it’s neat to see what has changed and what hasn’t in the forty years since the film was made. Also included here are some new deleted scenes and outtake footage, just over fifteen minutes of material. We see some shots in the van, some footage shot in the cemetery, some outtakes with the hitchhiker, footage from the gas station, and plenty of interesting clips and deleted bits shot at the house showing everything from Teri McMinn on the swing to Marilyn Burns pushing Paul A. Partain through the brush in his wheelchair to Gunnar Hansen doing his thing with the saw in the dark (some of this footage with Hansen in particular is very cool). There’s also some unused footage from the dinner that’s pretty great too. There’s no sound for any of this material and it’s all presented fullframe. 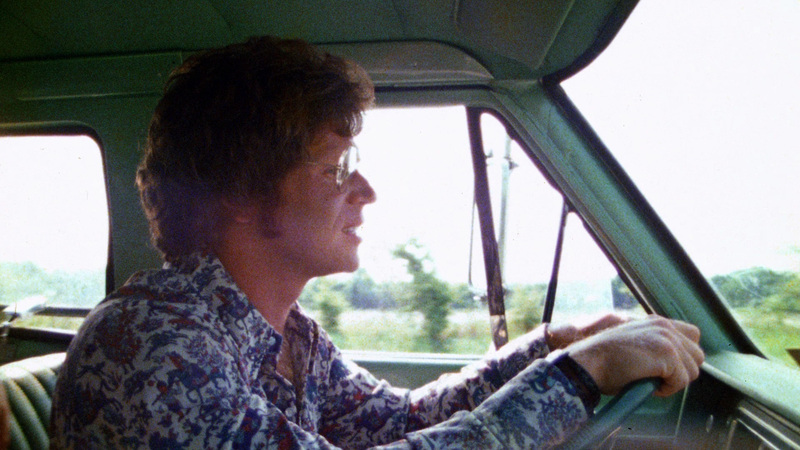 In addition to the new featurettes the disc carries over a ton of extras from past releases as well starting off with David Gregory’s exhaustive documentary, The Texas Chain Saw Massacre: The Shocking Truth. Though this has been released before, its inclusion here adds a lot of value to an already stacked package as this seventy-five minute documentary peels away pretty much every layer surrounding the history and making of the movie. With much of the film’s history already so well documented in various books and in the two commentary tracks on the first one, it’s interesting to see here that Gregory focuses on the seedier side of the movie’s roots by way of examining the film’s distribution history and exposing some of what really happened with the people who bankrolled it. Additionally, pretty much every cast and crew member who could be wrangled up appears here to tell their story in front of the camera and so through this piece we’re able to learn even more about the film. 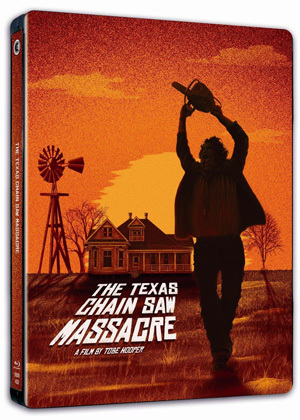 Additionally, this documentary also spends quite a bit of time talking about the three sequels that The Texas Chain Saw Massacre spawned so we not only get a look at Hooper’s first film and its follow up but also the underrated Leatherface: Texas Chain Saw Massacre III and Kim Henkel’s completely awful The Texas Chain Saw Massacre: The Next Generation (starring Matthew McConaughey and Renee Zellwiger!) from 1994 as well. In addition to interviews with cast members like Gunnar Hanson, Marilyn Burns, and Edwin Neal we also get segments with director Tobe Hooper as well as Kim Henkel and more as well as some thoughts from Jim Van Bebber who does quite a good job explaining some of the film’s influence on his work. Just under eight minutes worth of outtakes from the documentary are also included here. 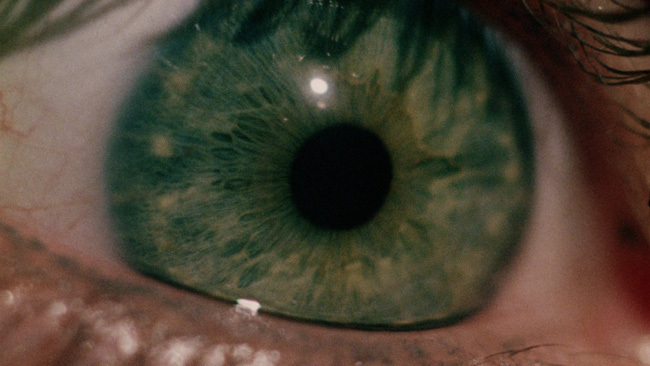 If one feature length documentary weren’t enough, Second Sight has also provided Flesh Wounds: Seven Stories Of The Saw, which is Mike Felsher’s seventy-two minute seven segment look at various aspects of the film and its history. Covered in this piece is Daniel Pearl’s involvement in the film as cinematographer which culminates in a really interesting comparison to his work on the original film versus his work on the 2003 remake. 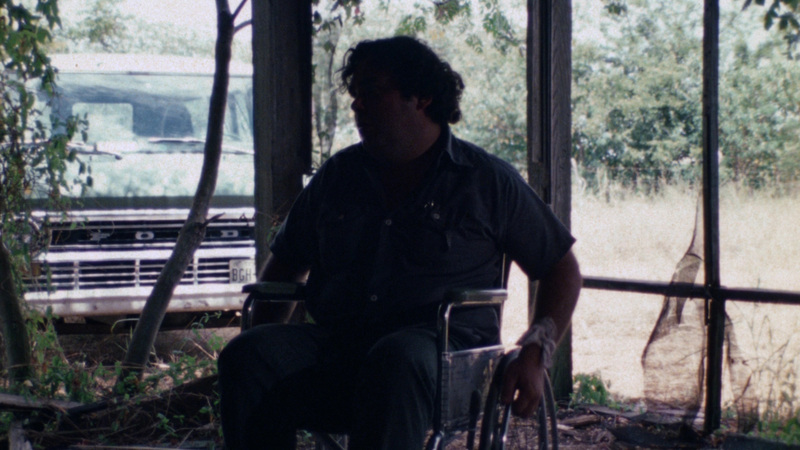 Tim Harden, who is the president of the official Texas Chain Saw Massacre Fan Club is interviewed and he speaks at length about his love for the film before telling us some interesting history behind the house where the movie was shot. W. E. Barnes was the effects man who did the latex parts for ‘Grandpa’ in the film and here he explains how his work as a plastic surgeon came in handy while working on the film and he’s followed by a very candid segment with Edwin Neal who we all know as the ‘hitchhiker’ character. Neal basically just cuts loose and gets really animated as he does some bits that border on standup comedy before spilling his guts as to what it was like for him to have worked on the film. From there we see a somber tribute to Jim Siedow and Paul A. Partain, both of whom passed away before this documentary was made. This is made up of some quotes and thoughts on the two men and it makes for a nice way to recognize their involvement in the film. 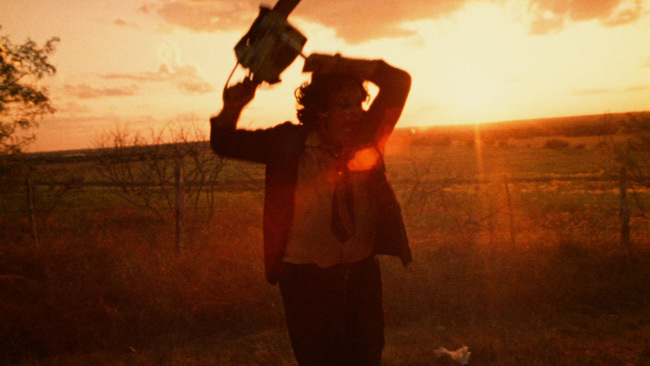 Footage of a Texas Chain Saw Massacre reunion that took place at the Cinema Wasteland Convention is up next, and it includes some interviews with the convention organizer, and things finish off with an interview with Gunnar Hansen who covers what it was like to be Leatherface and gives us a good idea of what his experiences during the shoot were like. When it’s all said and done, this is yet another interesting, entertaining and very comprehensive look at a few different aspects of the production. Off The Hook With Teri McMinn is a seventeen minute long interview with the actress who talks about her work on the film including how she initially tripped in her entrance to the bone room in the house. She also chats about how she wound getting into the movie in the first place, the infamous ‘short shorts walking to the house’ scene and how she was initially horrified but has since come around to it. Of course, she also talks about the meathook scene in addition to working with the various cast and crew members and the infamous freezer scene as well. 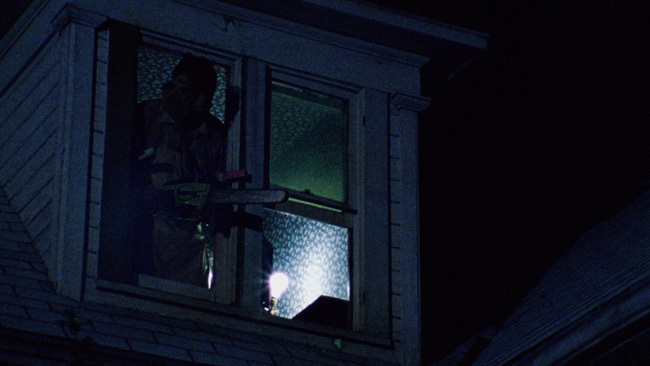 Production Manager Ron Bozman shows up to talk about The Business Of Chain Saw for sixteen minutes, talking about how some investors initially came to him to manage the film. He talks about the initial budget, how they intended to shoot independently in Austin, and a lot of the challenges involved in getting the movie finished. He also talks about meeting with the Sheriff of Williamson County so that he would know that nothing was going on outside of a horror movie shoot. This wound up backfiring in a way in that the guy who owned the house that was rented was a pot grower, which he didn’t realize until AFTER he’d invited the Sheriff to visit the set! 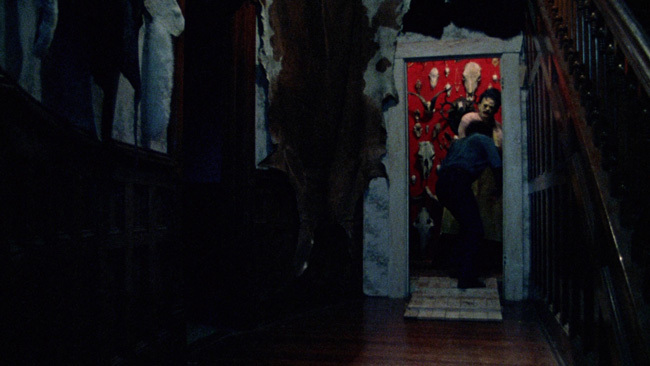 Also look for an eight-minute long segment where Gunnar Hansen takes us on a modern day tour of the house used in the film. It’s interesting to see what the house is like now compared to what it looked like in the movie, the differences are quite drastic and Hansen provides some humorous on camera commentary over top of the shot on video footage. Tobe Hooper is interviewed here for fourteen minutes and covers a lot of the same ground that he covers in the two commentary tracks – talking about putting the crew together, the state of affairs in Texas at the time, shooting certain scenes, working with the cast and crew, etc.. Kim Henkel is also interviewed here for eight minutes about how the movie relates to what happens to society without a female influence, how he was working as an illustrator during the day when he and Hooper were writing the movie, where some of the ideas came from, the morale schizophrenia that inhabits some of the characters in the movie and a few other subjects. Those who have owned past releases going back to the laserdisc will be familiar with the twenty-five minutes worth of outtakes and deleted clips from the film that are also carried over. They’re presented as one big piece rather than broken down into individual clips but this material is worth sitting through if you haven’t already done so to get a glimpse at some of the interesting footage that didn’t make the cut. There’s a fair amount of roadkill footage in here so those with a soft spot for animals might be put off but some of the shots such as those of an armadillo and a rotting dog corpse really do set the mood of the film quite well. Also included here is a blooper reel that clocks in at just under two and a half minutes in length. This is moderately amusing material as are the clips from the Shocking Truth documentary that find a new home alongside the original film’s clips. Rounding out the extras on the second disc are two and a half minutes of bloopers from the shoot, a collection of trailers and TV spots, a few radio spots, a still gallery and some animated menus. It’s hard to imagine improving on this release – it’s absolutely stacked with extra features and the audio and video quality is excellent across the board. The movie itself remains an amazing achievement and one of the most effective and genuinely terrifying horror films ever made. Have the issues found on the US disc been fixed as promised by Second Sight? Dark Sky didn't send us one to review so I don't have that disc to compare it to and therefore haven't seen/heard them first hand, but it seemed fine to me based on what I've ready online.